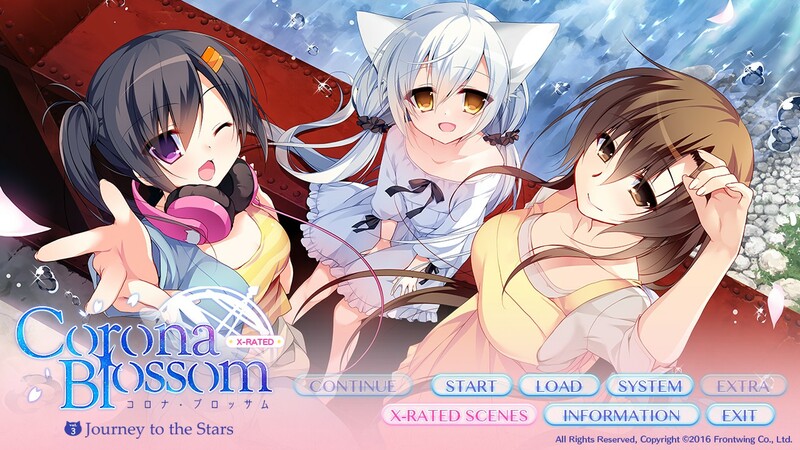 The day has finally arrived where the Corona Blossom Visual Novel is complete. All 3 volumes of the story were successfully crowdfunded through IndieGoGo, and the development team was able to deliver the content in a timely fashion. As such this final review will have one alteration that differentiates it from the reviews for Volume 1 and Volume 2. Now that I have the full picture of the story and content, I’ll be adding an additional section about the story overall and what worked (or didn’t work) about a segmented release. However, to maintain consistency the final score reflected will be purely for this volume alone, just like the previous two review scores. Volume 3 once again picks right up where Volume 2 ended. Just like in the previous release, Volume 3 picks right up where Volume 2 ended. So if you do not want to be spoiled for the previous release then you should really avoid reading almost the entire review. It would be impossible to discuss the story at all without talking about the previous events, but I will avoid spoilers for the way that this volume ends. We left off the last game with Kanade doing an abrupt about face and trying to take R-ne for herself. But if you look closely at the above screenshot for that scene there is a major hint that not everything is as it seems. One interesting thing about this event is that it always felt a bit darker and more serious than the cliffhanger from Volume 1. In that scene, Lily Shamony was doing something similar, but we knew enough about her previously to know that she was a bit of an idiot, just under the surface she’s really a good person, and she was unlikely to ever really want to hurt anyone. With the major change to Kanade and with some of the things she was spouting off about, we were in very uncharted territory there. Even when things are at their worst, the writing still can turn humorous at any time. As someone whose only previous experience with Frontwing was Grisaia, there were several times I was very concerned about the safety of R-ne and others. 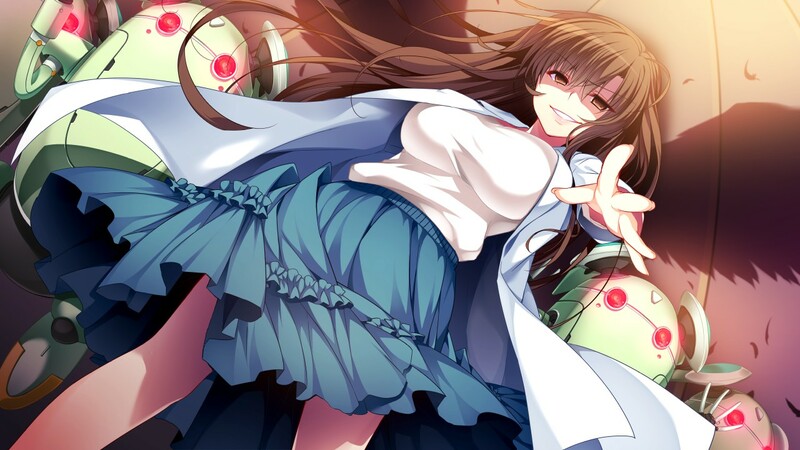 Certainly, that previous major Visual Novel showed that this studio is not afraid to go extremely dark at times. Thankfully with this release they actually stopped short of quite going that direction and even when things were pretty bad for our heroes, they still inserted some humor to release the tension. Also, you are still given reasons to see things from the antagonist’s point of view, even if there is one new character that is pretty reprehensible. Unfortunately, I cannot really talk about that new(ish) character much because that is kind of a major spoiler. But what I will say is that I was happy they made sure to give Kanade herself the redemption she deserved within the bounds of this story, so that those who really liked her character were not just thrown under the bus. Even if there were some very serious subjects throughout all three volumes of this story, the end result ended up feeling like a pleasant time where the bad times helped remind you of how precious the good times could be. And the story gains major points in my book for that attribute, those are my favorite kinds of stories. 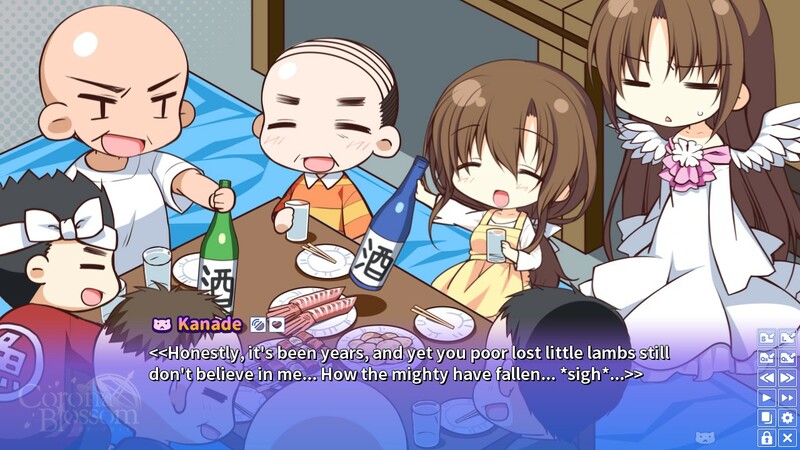 Even though I recognize The Fruit of Grisaia as my favorite Visual Novel of all time, I do not go back and replay it nearly as much as I otherwise would because the story goes so depressing or horrifying so often. Even though it’s less serious, the writing quality still remained outstanding. So while I won’t place this quite up there with their immortal previous work, the tonal change did not include a slacking off of their previous standard of stellar writing quality. There is a lot of alien technology and fictional elements to the story but, where the story delves into real-world history and science, the developers repeatedly show how well researched they are. Frankly, even candy coated stories like this one put most Western developers to shame. Not only does this story repeatedly make you laugh, but it also makes you think and has the huge benefit of being extremely accurate so you don’t feel cheated if you need to look up any of the real world terms. But, in the end, the greatest pleasure will remain just spending time and having a lot of fun with all these great characters. It is a major VN trope that men are hardly ever seen, but these ones have a lot of personality. There are no other new characters (other than the one that I can’t talk much about), but there are two characters that really come into their own and were a highlight in Volume 3. The first, surprisingly, was the townspeople themselves. The town has always been slightly interesting, and it became even more interesting in Volume 2, but in this section, the town really became a beloved place full of interesting surprises. In a way, it kind of reminded me of Higurashi, where the town was a character all it’s own. You still never see any of the townspeople other than in the rare chibi artwork (like you see above). But they had such bold personalities and they had so many speaking lines in this section of the story that it seemed like a missed opportunity to not show them. 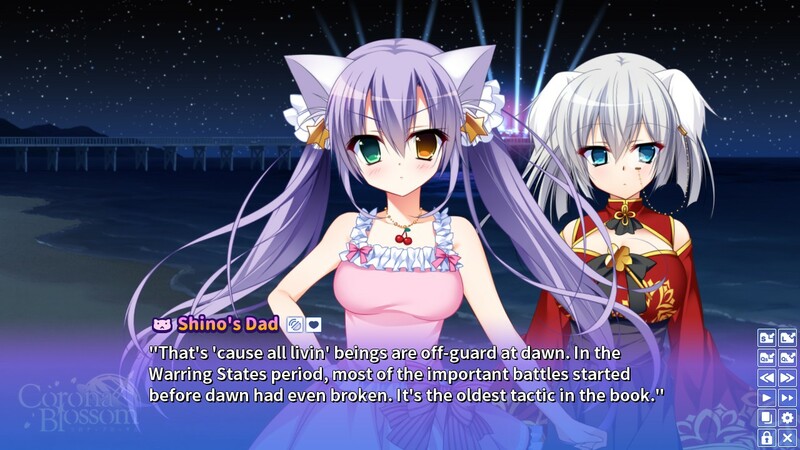 I definitely understand that it would have taken more time and more budget to make all the art assets (and the programmed movement that this VN engine uses), but mostly it just felt that they weren’t shown by VN tradition. That’s not a major complaint, though, if you can even call it a complaint that they wrote characters so well that I wanted to see more of them. 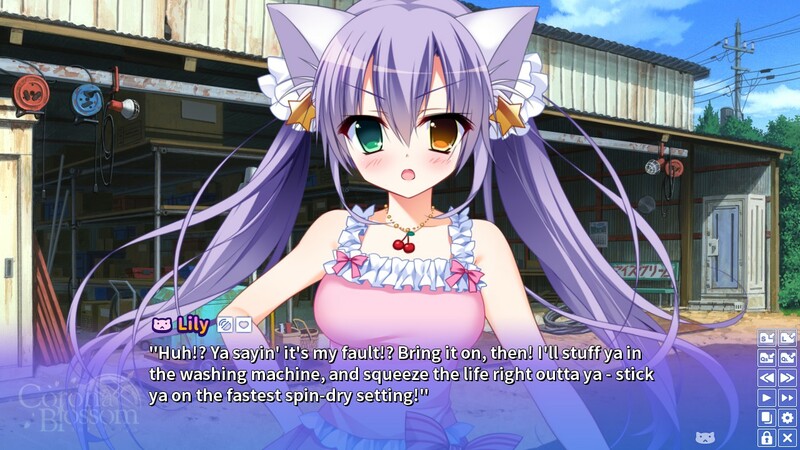 If there is ever an anime adaptation of this VN, Lily will become a very popular character. 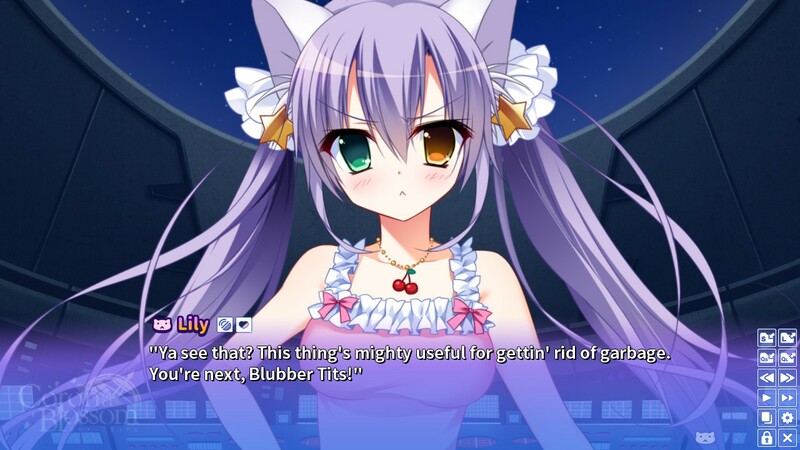 The other character that really shines at the end of this story is the pirate captain, Lily Lucalusa Shamony. Needless to say, in our Operation Rainfall Awards for 2017, I was one of the ones who voted on her for the most interesting villains of the year. But there is little doubt that she’s not even remotely a villain in Volume 3 like she ostensibly was in the first two parts of this story. She had the most character growth of anyone, along with R-ne, but even more than that she was just super fun every time she was on the screen. Her tsundere act became so beleaguered that even the bottle blond Michiru seemed a genuine tsundere compared to her. She was not only very funny, but she had some really endearing and heartwarming moments throughout the story that showed how relaxed she had become and also how much more honest she was starting to become with herself and those around her. Her X-Rated scene was also possibly my favorite in the whole series, the end of it made my jaw drop and had me laughing out loud imagining her actually saying and doing that.